“If you don't know where you’re going, you won’t know when you get there” - one of Yogi Berra’s famous pronouncements and Russell Frackman’s favorite. Russ likes to point out it reflects the unintended path his career has taken. 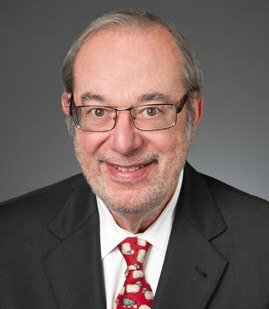 He arrived at MSK in 1970, as its 40th lawyer and fresh out of law school, before “intellectual property” existed as a term of reference, and long before many of the laws he’s navigated in his career. He didn’t know it then, but he had “gotten there”. Russ quickly became the “music man”. From the 8-track to the cassette to CD’s to the internet, changes in the creation, distribution, and consumption of music mirrored the course of his career. This Brooklyn boy, whose mother wanted him to be an accountant, was an unlikely candidate to tackle what would become the most famous modern day case in copyright law. As he likes to point out, he was still getting “comfortable” with e-mail when he dove headfirst into the technology behind Napster and successfully represented the recording industry as lead counsel in its seminal case. Russ approached the case and guided it to a successful conclusion with the same thoughtfulness and thoroughness he had applied to countless cases over his decades of practice. Those who know Russ describes him as the ultimate nice guy, a personality trait atypical of a successful trial lawyer and a far cry from the colorful nickname he earned in the Napster case - - “Russell the Muscle”. With all of Russ’s success and high profile representation over the years of clients such as The Rolling Stones, Coldplay, Neil Diamond, Jimmy Page, Jack Nicholson, and Paul Newman, he has maintained the same standards that one of his mentors at MSK impressed upon him early in his career: be tough but be fair. Mr. Frackman is a “go-to” lawyer for the entertainment industry through his stewardship of many of the most important copyright and trademark cases to have been litigated in recent years. Mr. Frackman is recognized as one of the nation’s leading entertainment and intellectual property litigators, having successfully represented clients in a number of landmark cases in state and federal trial and appellate courts. Mr. Frackman was lead counsel for the record company plaintiffs in the District Courts and Courts of Appeals in the seminal Internet file sharing litigation, A&M Records, Inc. v. Napster, 239 F.3d 1004 (9th Cir. 2001), and 284 F.3d 1091 (9th Cir. 2002), In re Aimster Copyright Litigation, 334 F.3d 643 (7th Cir. 2003), and Metro-Goldwyn-Mayer Studios, et al. v. Grokster, Ltd, et al., 545 U.S. 913 (2005). Mr. Frackman was also the lawyer in two precedent-setting decisions involving the scope of the Digital Millennium Copyright Act (DMCA), Rossi v. Motion Picture Assn of America, Inc., 391 F.3d 1000 (9th Cir. 2004) concerning the notice and takedown provisions of the DMCA, and 321 Studios v. MGM, 307 F. Supp. 2d 1085 (N.D. Cal. 2004) concerning the anti-circumvention provisions of the DMCA. Mr. Frackman currently represents the plaintiffs in Capitol Records, LLC et al. v. Vimeo, LLC, et al., 972 F. Supp. 2d 500 (S.D.N.Y. 2013) and 972 F. Supp. 2d 537 (S.D.N.Y. 2013), involving the application of the DMCA to a user-generated content website. Currently represents the record company plaintiffs in litigation against Sirius XM Radio, Inc. and Pandora Media, Inc., in precedential cases involving the issue of performance rights under state law for sound recordings “fixed” prior to February 15, 1972 (and thus ineligible for federal copyright protection). Filed on behalf of numerous music industry organizations (including the Recording Industry Association of America, SoundExchange, Inc., the Recording Academy, BMI and ASCAP), amicus curiae briefs supporting content providers in the Supreme Court, American Broadcasting v. Aereo, Inc. [134 S.Ct. 2498 (2014)], and the Courts of Appeals for the Ninth Circuit, Fox Television v. Aereokiller, LLC [No. 13-55156], and the Second Circuit, Viacom Int’l, Inc. v. YouTube, Inc. [No. 13-1720-cv]. Obtained a “precedential” opinion sustaining, on both likelihood of confusion and dilution grounds, an opposition to the registration of a trademark infringing the world-famous “Motown” trademark. UMG Recordings, Inc. v. Mattel, Inc. 100 USPQ2d 1868 (TTAB 2011). Represented as lead counsel several record companies in obtaining affirmance of a contempt citation and permanent injunction enjoining the auction of thousands of infringing recordings. A&M Records, Inc. , et al v. LaMonte, et al, 366 Fed. App’x. 736, (9th Cir. 2010). Obtained a preliminary injunction against, and then a summary judgment holding liable, an online company that provided digital “simulations” of thousands of commercial recordings (including virtually all of The Beatles recordings) as lead counsel in an important case of first impression involving the scope of rights in sound recordings under § 114 of the Copyright Act in Capitol Records, LLC, et al v. Bluebeat, Inc., 765 F. Supp. 2d 1198 (C.D. Cal 2010). Obtained summary judgment for defendant on audit claims based on contractual limitations provisions. Clinton v. Universal Music Group, 2011 WL 3501818 (C.D. Cal. Aug. 9, 2011). Lead counsel in the Ninth Circuit for defendant in E.S.S. Entertainment 2000, Inc. v. Rock Star Videos, 547 F.3d 1095 (9th Cir. 2008), involving First Amendment issues concerning the use of trademarks in video games. Obtained summary judgment dismissing for lack of standing a copyright action against Jay-Z, Linkin Park, and others, holding plaintiff did not possess an exclusive copyright interest. Nafal v. Carter, 540 F. Supp. 2d 1128 (C.D. Cal 2007), aff’d 2010 WL 2852571 (9th Cir. July 21, 2010). Lead counsel for record company and music publisher clients in more than 100 related copyright infringement cases arising from the alleged unauthorized “sampling” of musical works in musical compositions and sound recordings, most recently arguing in the Court of Appeals for the Sixth Circuit in Bridgeport Music, Inc. v. WB Music, Inc., 520 F.3d 588 (6th Cir. 2008), involving recovery of attorneys’ fees under the Copyright Act. Counsel for plaintiff in claim for copyright infringement against search engine “image search” function, Perfect 10 v. Google, Inc., 416 F. Supp. 2d 828 (C.D. Cal 2006), aff’d. in part and rev’d. in part, 487 F.3d 701 (9th Cir. 2007). Counsel for amicus NBC Universal in Tur v. YouTube, Inc., 2007 U. S. Dist. LEXIS 50254 2007, WL 1893635 (C.D. Cal., June 20, 2007). Obtained summary judgment defending an infringement claim brought against a record company client and involving a hit recording of the rap artist 50 Cent, Lil’ Joe Wein Music, Inc. v. Jackson, 2006 U.S. Dist. Lexis 78367 (S.D. Fla. October 27, 2006), aff’d., 2007 U.S. Dist. LEXIS 19165, 2007 WL 2274519 (11th Cir., August 8, 2007). Represented defendant in litigation involving pre-emption of right of publicity claims based on use of recording artist’s voice fixed in a sound recording. Laws v. Sony Music Entertainment, Inc. 448 F. 3d 1134 (9th Cir. 2006). Represented defendant in trademark infringement and unfair competition action seeking damages and to enjoin the hit recording “Barbie Girl.” Mattel, Inc. v. MCA Records, Inc. 296 F.3d 894 (9th Cir. 2002). Recipient of the GRAMMY Foundation® 2015 Entertainment Law Initiative Service Award in recognition of 45-year career protecting rights of the music industry. Initial recipient of the Donald E. Biederman Legacy Award presented by the Entertainment Media Law Institute of Southwestern Law School. Russ Frackman and Christine Lepera Named to Billboard's 2018 List of "Top Music Lawyers"
Christine Lepera and Russ Frackman Named to Billboard's 2017 List of "Top Music Lawyers"
Mitchell Silberberg & Knupp Recognized as Leading Law Firm by The Legal 500 2015 USA Guide! Russell Frackman Chosen Among The National Law Journal's "100 Most Influential Lawyers in America"
Frackman and Pagnanelli Selected by LABJ for "Who's Who in Intellectual Property Law"
Bill Cole and Russ Frackman Among "Who's Who in Entertainment Law"
Daily Journal Names Russell Frackman Among "Ten California Lawyers Who Helped Shape the Past Decade"
Russell Frackman Featured in Lawdragon's "Lawyer Limelight"
Frackman Talks With CNNMoney.com About "Napster Effect"
The Hollywood Reporter Recognizes Bill Cole and Russell Frackman to its List of 2009 "Power Lawyers"
The Legal 500 Ranks MSK Among "Top Firms" and Partners Among "Leading Lawyers"
LABJ Finds MSK Partners The Best of the Bar in L.A. The Hollywood Reporter Names Russell Frackman to its List of 2007 "Power Lawyers"
Appealing YouTube: The Experts Debate! he True Cost of DRM: What Can't We Do Now?